Tina Bonner has over a decade of entrepreneurial experience, Tina is seen as a business mentor and marketing guru with high level certifications in inbound marketing and digital marketing. When she is not coaching clients on their business strategies, she is sure to be boarding a plane, hanging with her family, or hitting the town with her girlfriends. Tina is a native of Alexandria, VA, an active volunteer in the community, and a proud member of Alpha Kappa Alpha Sorority, Inc. Tina invites you to connect and learn from her journey. Tina: I was a very privileged kid, I will say that. I had super supportive parents. Growing up was the easy part. It wasn’t until I got to older ages around high school that I wanted things for myself. Early on, I got introduced to entrepreneurship. While my girlfriends at 7 or 8 years old were playing with Barbies, I trying to sell lemonade at the lemonade stand. I’m trying to flip bracelets, hats and anything you can imagine. My dad was always an entrepreneur. That’s kind of been the thread. My grandfather was an entrepreneur. It’s definitely ran in my family. HOW DID YOU BECOME A DJ FOR WALE'S LABEL? When I got to college my brother said, “Hey, I had this vision of you being a DJ” and I was like, “Okay, tell me more.” I never listened to music. It was never my thing. I was never the person that was like, “I’m going to spin records and rap.” That wasn’t me. The very first question that I asked was, “How much money can I make?” I was 18 and freshman at VCU at the time. He said, “Nobody is doing it. I think you can make a lot of money.” Literally, that conversation changed everything. He showed me what I can do and I said “I’m doing it.” I had a conversation with the student activities director and was like, “Listen, this is what I’m doing outside of campus.” I think I asked to DJ at Homecoming and they said “No way.” They did let me do stuff at the student center and I just worked my way up. I used to lie at the beginning of my DJ career and would tell people that I had done certain things that I hadn’t and used to tell people, “I’ve been DJing forever.” I’ll never forget my very first party and saying I was a DJ. I got there and bombed it. It was terrible. I think I got booed that night. I was motivated by that experience. The next semester, I came back with my equipment and was booming. The following semester, I was the official DJ for the school. The next year, I transferred to Howard and got signed to Wale’s record label at the time, The Board of Administration. What did you study at VCU? Tina: At VCU, I studied communications. My one question to my advisor was “What is one major that I can do and get through the easiest?” He said, “Communications” and I said “Sign me up for Communications.” I’m in love with education, the concept of education, and I love knowledge. I really wanted to get into the technical parts of the school system and I couldn’t do it. I was a little frustrated with school and I was trying to get in and get out. I will say that I was excited to go because I am the first person in my family to graduate from college. It’s something for my children to be able to follow. Either way, I know it’s important. 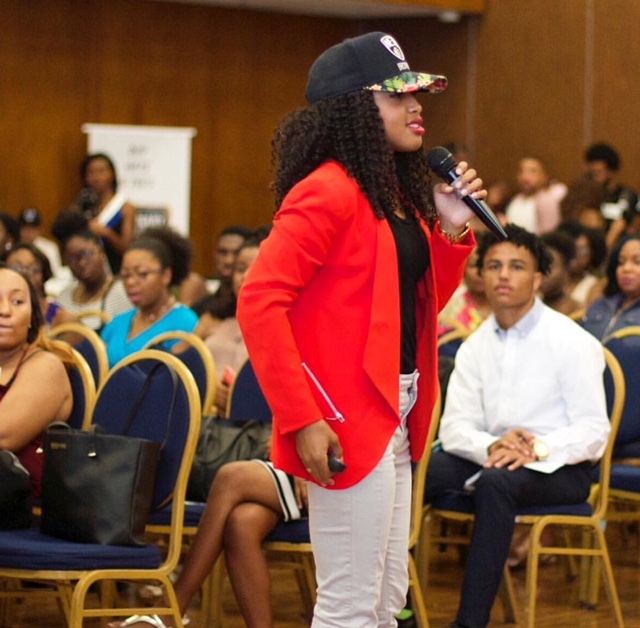 Tina: A lot of people said, “How did you transition from DJing all the way over to marketing and tech?” The transition was birthed out of pain. I was tired of DJing. I was in the club four or five nights a week. I had to get to a point where I said, “What I tolerate is going to become my normal, so if I tolerate this, it’s going to be my normal life. I have to do something now before I really burn out.” I started using the skills that I have and I challenge anyone who’s listening to look at the inventory and the skills that you have and how to transition. In business, it takes a level of toughness. Entrepreneurship is the hardest thing I’ve ever done. So many nights, I wanted to cry. So many nights, I have cried. So many nights, I have applied to jobs and didn’t go to the interview because I’m like, “I just have to keep going.” It’s been very tough. I’ve had a bank account at zero many times. That’s just the transparency. I think what kept me going is knowing that this is for a bigger cause. DJ'ing was great for my network. Between the business cards, people just coming up to me, and rocking the mic a little bit that allowed me to have network so when I did transition to the next thing, I was just able to carry everybody over. That’s really what I got out of it-a lot of great connections. I think I got charisma,too. The ability to have tough conversations- I had to punk some people to give me my money sometimes. I’m not going to call anybody out because you know who you are! All that stuff gives you the soft skills to do business. I have always been a designer so I said, “Maybe I can figure out how to tap into design work.” I found a developer over in Bangladesh who was developing apps. I put my designs over the top of it and he was charging me 4 or 5 dollars and hour and I would upsell it for four times the price. I got into the tech field that way. The idea about ladder switching is that I built apps for people in the industry that I was already in. My first few clients were The Park, DJ Quicksilver, and DJ DC. Those were my first few clients and that’s the idea that all I did is stay in the industry that I was in and I transitioned slowly. SO TELL US MORE ABOUT TINA B THE BRAN AND business? Tina: Since I moved to Atlanta, I have a couple different things going on. The personal brand is booming so I’m excited about that. I’m at a really good space. You know when you feel yourself getting better? You used to try to bench 200 and then you’re like, “I’m really bench-pressing 200 now!” I’ve been trying to bench 200 for a long time and I feel like I’m at a place now where I can walk in the gym and I’m benching it with no problem. I feel like I’m getting better by the second. Because of that, I really want to share what I know with others so that’s what the personal brand is about. My business day-to-day is two parts. One is more strategy based. I’ve stepped into technology consulting so if you have an app idea, web idea, or something stuck in your mind like, “How can I make this come to life?” we do consulting and help people bring their ideas to life as it relates to technology. The second thing that I do is, I have a startup. I’m at the Atlanta Tech Village and I’m excited because I’m actually on a scholarship there. We’re one of the few companies there that are on a scholarship. What we’re building is a platform to help influencers monetize. A lot of people have big followings, and big networks and aren’t making any money or they aren’t making it residual. We want to help people make money and tap into residual income but do it automatically. Our software once you plug in, you’ll be able to do that. We’re about seven or eight months in and we should be finished with the platform at the top of the year. What’s one lesson that you’ve learned from entrepreneurship that has been the most valuable to you in your journey? Tina: What makes sense in my life right now is the challenge of partnership. You can have bad situations or situations that don’t turn out favorably and that can taint a situation for the future. Because of that, I realize the value of partnership even more. I can say that where I’m at now, I will never do a business by myself. Even though some situations that I’ve had may not have ended well, I won't stop me from making the right moves in the future. I will always have partners, but I will always make sure we know who’s in control. I will always makes sure we always know who’s really the CEO, the entrepreneur, the manager, and the technician. Who are two people that would be on your Mount Rushmore of Inspiration? Tina: Eric Thomas. There are times when you need some motivation and ET gets me there. I love what he’s doing. I can listen to something and just be “ON.” I would love to be able to meet him and just catch his energy one day. When it comes to business, who I really love is Russell Brunson. I’m really inspired by him and his zeal. He just has such a good heart. I love that he’s not afraid to talk, even about his religion and is openly a believer as I am too and he’s just willing to go hard with his business. He’s so transparent but he’s willing to give all his secrets. That’s the difference. When it comes to business, that’s my guy. Shoutout to Russell! What is your passionate and when did you know? Tina: To be honest with you, I really found out what I was passionate about this year. I started DJ'ing because I liked business, not because I liked music, which is also why I burned out really fast. I wasn’t built for it. What I’m passionate about is people. I love helping people get better so my passion is people and seeing results, You’ll see me on Instagram like, “Talk that talk” or “If we’re not talking about results, we’re talking about nothing.” I just get excited because results changed my life. If it’s a hobby then that’s okay, but when you talk about passion, if you follow your passion and create a business around something that’s only meant to be a hobby, you’re going to burn out. I’m trying to save people from burning out. What separates people that have realize those dreams and passion from those who haven’t? Tina: Exploration and discovery. The only reason we can articulate our passion is because we discovered it. We went through the motions and we failed. We had a good event and we learned from it. We had another event and that one failed, too. I figured that every time I do an event, I realized “I really liked that” or “I don’t really like doing that so much.” After time you realize there’s a formula of things that make me passionate and that’s how you put the pieces of the puzzle together. Passionate doesn’t come overnight. It’s breadcrumbs. That’s the thing about God. Our destiny is in hot pursuit of us. You’ll find your passion when you keep going. Tina: I going to try not to get deep but what inspires me to succeed is obedience. When you know that there’s something that you’re supposed to be doing, and that God has put in your life to do, NOT doing it is disobedient. You not doing it is affecting others. Every time you don’t record a video, someone is affected by it. For me what inspires me to keep going is knowing that one, If I don’t do this, I’m not being pleasing to God because He created me for this. Number two would be every time I abandon my purpose, somebody else doesn’t get touched that was supposed to be touched by what I’m doing. Every time we abandon our purpose, someone misses out on where you were supposed to touch them. I get inspired and keep doing what I’m doing because people are counting on me. With so many things going on in the world, what would you say frustrates you the most about today’s culture? Tina: What frustrates me the most about our culture is the microwave society. We want stuff so fast. People will start a business today and not make any money tomorrow and will be like, “I’m done.” What frustrates me the most is the lack of zeal and the sugarcoated ambition. We think you’re ambitious, but you’re not. It’s almost like fool’s gold ambition. People want something so fast but they don’t want to work for it, they don’t trust anybody so they don’t want to partner with anybody. We don’t want to put other people on and we don’t want to share our secrets. It's overly complex. We’re so smart, that we’re not smart. What’s one book that has impacted your life as an entrepreneur? Tina: As an entrepreneur, two books stand out. One is E Myths Revisited. It changed my life. If you’re watching this and you’re in your first two years of entrepreneurship, E Myths Revisited, absolutely changed everything I thought about business and liberated me. The second book that gave language to my personality was called Smart Cuts. It talks about how entrepreneurs accelerate success and what happened was that book just changed how I thought. Most people are not lost, they just don’t have language for their season. I thought I was lost but I just didn’t have language for where I was. Reading that book gave me language for my life and how I think. It was like, “Okay, I’m not lost, I just didn’t know how to articulate what I really do.” That’s what reading can do for you. It inspired me to create my own podcast because it talks about hacks and stuff like that. I really believe that there are cheat codes to greatness. My podcast is dropping in January. It’s called the “Cheat Code to Greatness” because there are cheat codes to greatness. I’ve been working on for some time, fumbling with the name. The content is there. You see the kind of things I put on Instagram and I just want people to get there faster. The science behind me switching from being a DJ to entrepreneurship and tech, there was a hack. If you can check that out, it would be great. I will be doing a sneak peek in the next few weeks. What advice do you have for young people of this generation that want to be tech entrepreneurs or want to realize their passion? Tina: Treat your life like an MVP. It stands for Minimal Viable Product. Live your life like that. The idea is that you’re not going to know everything and you’re not going to be able to build everything. If you got the business idea, don’t try to build it all out before you go to the market, Get something that you can actually have and share with other people and something that you can actually test. Get out there and do it. It wasn’t until I had my first event that I actually realized I like doing events and I actually want to do more of them. Everything you need is inside of you. You just have to get the right strategy. Interested in learning more or connecting with Tina?